Why do dolphins jump? Actually, they jump (also called a bow) for a number of reasons. 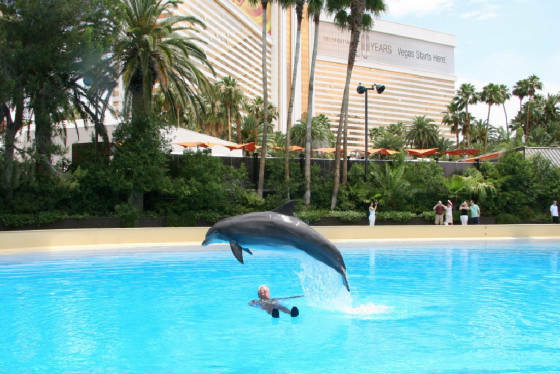 If captive, they may jump because this behavior has been reinforced with rewards such as food or by the trainer providing positive reinforcement such as applause, a high five, or a tap on the rostrum. As a natural behavior they jump to get high above the water to see around their environment. They are able to jump up to 20 feet above the water surface. This provides them the opportunity to look for predators such as sharks. Or it allows them to spot flocks of birds feeding on fish, a great way to locate their next meal. They may jump to shed parasites they have picked up in the ocean or to communicate their presence to other dolphins, saying, "I'm over here" or, "Come join me". Such jumps and resulting loud slaps on the water surface may also be an aggressive behavior, a dolphin's attempt to establish dominance within the pod. Bows may conclude with a head-first return to the water or may end with a side or back flop. These bows are referred to as "breaching". The powerful muscular peduncle (tail section) of the dolphin aids in such jumping behavior. It is the upward stroke of the peduncle and flukes which provide the power stroke. The muscles located along the upper (or dorsal) side of the peduncle are more powerful than those located on the lower (ventral) side. Thus the powerful muscles used in the upward stroke propel the animal forward, while the less powerful muscles return the flukes to the "start" position. As the flukes are raised in the upward stroke, their tips bend upward to catch more water and help the dolphin to move faster and to achieve higher bows. Here a 500 pound female Atlantic Bottlenose uses her powerful peduncle and flukes to provide the force to jump over me with plenty of room to spare. We know that migrating and flocking birds perform synchronous behaviors (performing behaviors together) based upon visual clues in their environment (flocks turning at once, migrations following geographic references). Synchronous behavior often occurs with dolphins, as well. Jumping together is an example of a synchronous dolphin behavior. There is some evidence to suggest that dolphins communicate with each other prior to, during, and after synchronous behaviors so as to coordinate these activities and to evaluate their success at working together. Synchronous behavior results from behavioral mimicry. It is believed that one dolphin acts as the demonstrator and the other dolphin acts as the imitator of the behavior. Some investigators working with Bottlenose dolphins have observed light areas on the leading or back edges of the fins and flukes as well as on the rostrum. One theory suggests these light areas may serve as reference points on which other dolphins may focus during synchronous behaviors, ensuring they are performed together. In the following video Atlantic Bottlenose Dolphins perform a number of synchronous bows at the trainer's request. In the following video a pair of male dolphins is seen performing synchronous behaviors including bows and fluke wags. The most precise synchronous behaviors in wild dolphins are demonstrated by bonded mail pairs. These synchronous behaviors include surfacing at precisely the same time to breathe, bowing together, swimming while in contact with each other's pectoral fins, and turning sharply together at exactly the same time. Such behaviors may be useful as a way in which to impress potential female mates, to warn other males that "We are tight; don't interfere with us", or just to express the close relationship each member of the pair has to one another.